Unfortunately, the PKR poker site (and casino) has closed its doors. Please read this article for more information. Online poker is a big deal. It’s been around for a while and the competition for great online poker experiences seems to get greater and greater with each passing year. Lots of rooms will offer giant bonuses, easy to use software and lots of education, as well as some top notch tournaments, but like everything online today, there seems to be something that’s missing with many of these sites. It’s the excitement. PKR Poker believes that they have the solution to poker boredom. In fact, the online poker experience that PKR offers might just be the next big thing in online poker, but you should really find out for yourself. So, what can you expect when you visit this online poker room and how is it different than others that you might have visited before? When you go to PKR Poker, you’re going to get to see the whole game as if you were actually sitting in the same room, at the same table as your opponents. This is almost like a video game experience, where you can immerse yourself in the experience. The beautiful 3D graphics allow you to socialize and really feel like you’re talking to your opponents. Walk into your tournament location, check out the table as you walk up to your crazy comfortable chair and see what all of the other players are made of. Maybe flirt a little, chat and even fake the others out with the range of emotions that you can share. You’re going to love the look and feel of playing poker online again, because it’s as close as you can get to the real deal without actually being there. 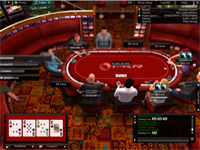 In fact, every game that you play on PKR will feature the same, beautiful 3D experience, and no matter if you’re practicing at some free games, or you’re playing with the high rollers, you’ll never miss out on excitement with this site. 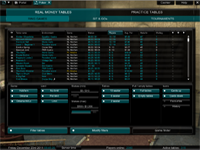 Another thing that you’re going to experience is how easy it is to enjoy playing online poker on virtually any budget. Any time you play with real money, whether it’s $.10 or $1,000, you earn points that you can use for any number of rewards. And there is always a chance to play – and win real money games. So, even if you’ve been struck by a rough night of insomnia, you can still sit in on a game and come out a winner – without risking your whole bank roll to do it. Not only that, but you can become a paying member and even enjoy a start up bonus for as little as $10. With this little deposit, you’ll be able to enjoy bonus points for your avatar, tickets to tournaments and even a free upgrade right away. You’ll also find the friendliest bunch of people on any online poker site out there. The members of PKR Poker are there for the same reasons as you; they want to play poker, and win, but they also want to enjoy the company of others who feel the same – and that’s why they play on this poker room as opposed to other sites out there. When you choose to play online poker with PKR Poker, you’re not going to see bonuses that are hard to cash in or expire before you can understand what’s going on with them. In fact, when you choose to make your first deposit and get to choose what level deposit you want to make, the terms of the bonus are laid right out there for you to see. Like it? Go ahead – make the deposit and enjoy a bonus that you can really enjoy. It’s that simple. You won’t find any kinds of loopholes or strategies to get out of paying you what was promised. You’re also not going to find online poker games that are too expensive for you to enjoy. Want to buy-in to that tournament that everyone’s been talking about but don’t have the funds to do it? Win your way toward it with other, less expensive tournaments and earn points while you increase your bank roll. You’ll get there with practice and then you can play like a high roller. You’re never going to be stuck browsing the site looking for a game to play that offers the chance to win real money. Other online poker rooms offer you the chance to win cash when you play, but PKR Poker is different. They offer tons of games that you buy into at every price range, and the chance for you to win real money with almost every game. PKR Poker also doesn’t believe in adding pressure to a situation. Sure, poker is exciting and fun. Sure, you’re going to want to be a great player to win big, but even if you’re not a big gambler, you can enjoy the lifestyle, the interaction and the online poker whenever you want. You can even play for free before you decide that you want to make a deposit. And the best part is that if you want to get a little practice without risking your bank roll, there are free games for that kind of thing. The bottom line is that if you’re looking for the next big thing in online poker, then you should give it a try with the original 3D online poker room. There are no gimmicks, no hoops to jump through and no hassles. Why would you want to play online poker in a place like that when you can join almost 5 million players worldwide who are just like you? PKR Poker wants to change the way you play online poker forever, starting with the way you see the game, literally. You can sit at your computer, by yourself, and stare at a bunch of cards on your screen, or you can immerse yourself in the world of online poker. The choice is yours, but PKR Poker can guarantee that you’ll never see online poker the same again.